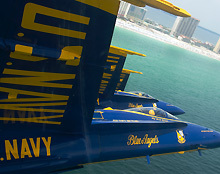 Pensacola, Florida has been referred to as "The Cradle of Naval Aviation". Naval Air Station Pensacola was the first Naval Air Station commissioned by the U.S. Navy in 1914. There are a number of annual festivals, events, historic tours, and landmarks. The Pensacola Seafood Festival and The Pensacola Crawfish Festival held in the heart of historic Downtown has been held for nearly 30 years with live music acts. Veterans Memorial Park in Pensacola is the home to Vietnam Veterans of Northwest Florida's "Wall South", a one half scale model of the Vietnam Memorial Wall in Washington, D.C.